ANDALUCIAN town Tolox, in the province of Malaga, will host its annual Fiesta del Dia de los Polvos (Powder Day Festival) on Shrove Tuesday 2016, which falls on February 9 this year. 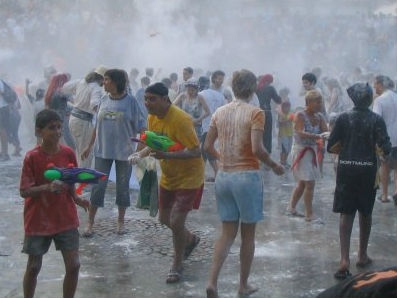 Locals and tourists will gather to take part in a 19th Century tradition that sees talcum powder or flour being thrown around until participants are completely covered. The annual event takes place in the Plaza Alta del Pueblo, and marks the end of the carnival held in the same town. According to one account of local history, the tradition originally began as a courting ritual in which young men made their intentions clear by covering their sweetheart with white powder. Initially played as a game, contenders had to find a way to completely cover the object of their desire by whatever means necessary, be that scaling a wall or climbing down a chimney. Other sources claim that the celebration refers back to a dispute between two Moorish and Christian women who were in love with the same man. Both were said to work in a kitchen and eventually released their frustrations by throwing flour at each other. These days the powder hurling is open to all, regardless of gender or other distinction, and the festival takes in visitors from far and wide. Up to 3,000 kilos of powder is normally used during the traditional celebration, which doesn´t involve a single pancake.